CodeTwo Exchange Rules 2003 enables adding footers (disclaimers and signatures) to mail sent in HTML, RTF or plain text format. Upon installation, in the main screen of the program (fig.1) the user will find four ready-made rules containing footers. These footers can be used as a basis for your own disclaimers and signatures by highlighting a rule with a left-mouse-button click and choosing Edit from the toolbar. You can also create brand new rules containing your disclaimers/signatures by clicking Add in the toolbar. The changes you make will become effective only after you have saved them. To do this, click Save or agree to save changes when exiting CodeTwo Exchange Rules 2003 Administrator. Fig.1. CodeTwo Exchange Rules 2003 main screen. The disclaimer/signature added by a given rule is specified in the Rule editor dialog box (fig.2) of the new or existing rule wizard. The new rule wizard is activated by choosing Add from the program?s toolbar, and the existing rule wizard is activated by choosing Edit. Fig.2. Edit rule dialog box and file paths for HTML and plain text disclaimer templates. 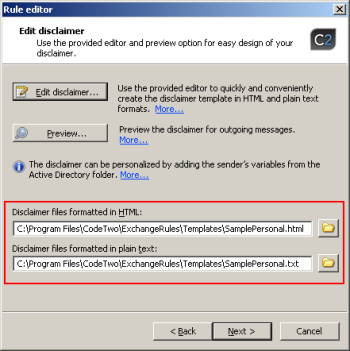 The Edit rule dialog box shows the file paths for disclaimer templates in HTML and plain text formats. If you already have HTML and TXT footer templates when creating a new rule, point to their location by clicking the folder icons to the right of path fields. The paths to HTML and TXT templates are independent and must be provided separately. The HTML-formatted footer is added only to messages sent in HTML format, while the plain-text footer is added to messages formatted in plain text only. If you do not have your own footer templates, take advantage of the built-in Signature Editor by clicking Edit disclaimer in the same dialog box (fig.3). Fig.3. Location of Edit disclaimer button in the Edit rule screen. The disclaimers you can create with CodeTwo Exchange Rules 2003 can contain graphics., e.g. company logo, staff member photos, facsimiles etc. Creating disclaimers containing images is very simple with CodeTwo Exchange Rules 2003 due to the built-in Signature Editor. The images embedded to messages should be located on a local disk because disclaimers containing hyperlinks to images located on WWW servers may become invisible to some mail recipients using certain mail clients. 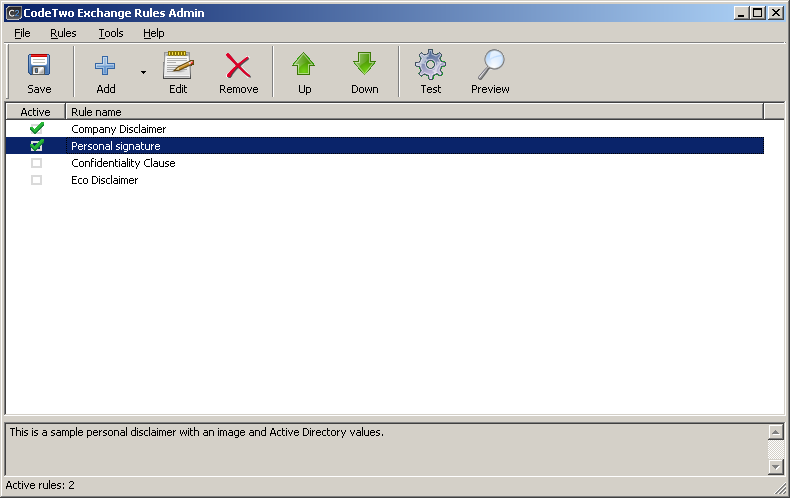 Another footer type that can be created with CodeTwo Exchange Rules 2003 are personalized disclaimers (signatures), containing variables from Active Directory. Personalized disclaimers will look differently for different staff members as the field codes in the signature will be translated to Active Directory values when the message is processed by the mail server. Personalized disclaimers can be conveniently created using the built-in Signature Editor. CodeTwo Exchange Rules 2003 has a built-in feature to process RT (Remove Text) Control Tags. This function proves especially useful with personalized disclaimers containing Active Directory placeholders. 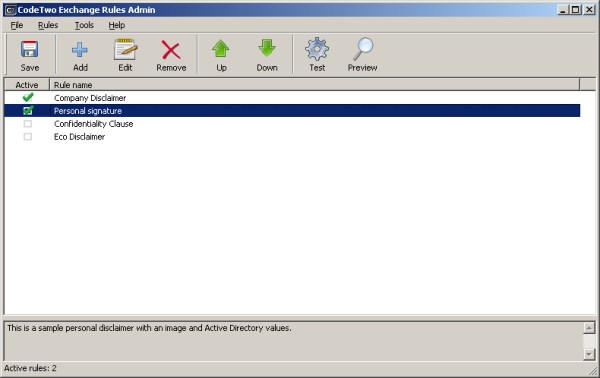 In the event that the placeholder cannot be filled with values due to the lack of corresponding data in the Active Directory base, RT control tags will remove the empty line(s) or redundant text in the disclaimer. RT control tags can be conveniently embedded into disclaimers with the built-in Signature Editor. The main toolbar of CodeTwo Exchange Rules 2003 features the Preview tool. This lets you see what the message will look like together with the disclaimer/signature added by a selected rule. To activate this tool, highlight a rule you want to run a check on, with a single left-mouse-button click and choose Preview from the main toolbar. Footers can be added to all internal and external outgoing messages. Footers cannot be added to encrypted or digitally signed messages. Footers are added to messages sent using all types of mail clients: Outlook, OWA, OMA, Blackberry, Entourage for Mac, iPhone, SMTP clients.